Located 6kms West of Chengannur Railway Station on the Mavelikera State Highway is the Maya Piran Divya Desam in Thiru Puliyur. This is one of the two ‘Puliyur’ Divya Desams, the other one being Sirupuliyur in Kollumangudi near Mayavaram. 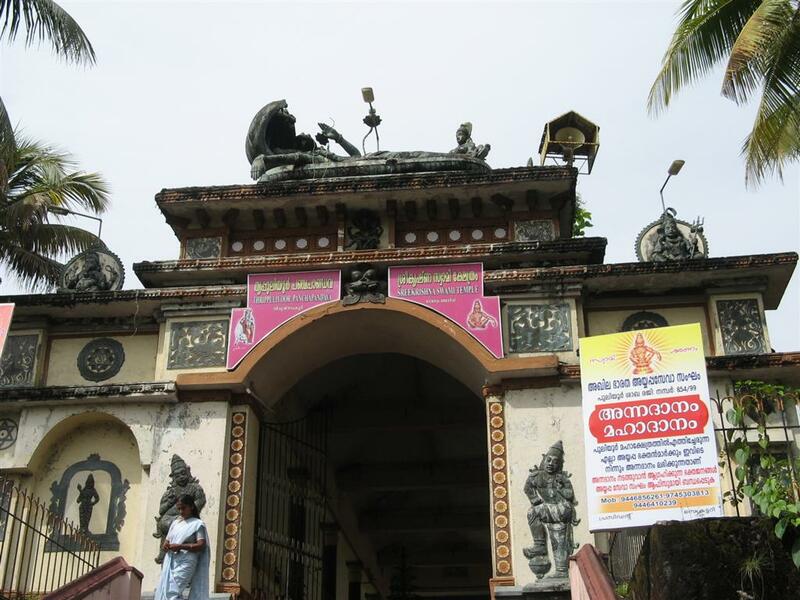 The Pandavas are said to have visited the Divya Desams in Kerala and each of the five Pandava brothers are believed to have built one temple in this region (around Chengannur). Bheema undertook penance at this place and created the Puliyur Divya Desam. Hence, this place is referred to as Bheema Kshetram. With the five Pandavas creating five temples, these temples have now been come to be referred to as ‘Anj Ambalam’ (Five Pandava temples) to folks in this area. This is one of the 108 Divyadesas. Of the Perumal temples installed in Kerala, this temple is believed to have been built by Beema. The club in the temple is too big size believed to have been used by Beema. The temple has a sturdy construction, long and wide as Beema on a vast land. According to the hymns of Nammazhwar, it appears there was big city in the region. Also according to the ancient Tamil Grammar text Tholkappiam, there were 12 divisions in Tamilnadu. Kuttanadu is one among them which people now call Kuttanadu Tirupuliyur. Perumal in the temple graces in a standing form facing east. The vimana – tower above the sanctum sanctorum is known as Purusha Sukta Vimana. Saptha Rishis (seven sages) had worshipped Perumal in this temple. In days of yore, the region was under the rule of one Vrushadharbi, son of Emperor Shibi. He was suffering from a severe disease due to some curse. His kingdom also came under severe drought and famine. During this crucial time, Saptha Rishis paid a visit to the place and called on the king. He told the Rishis that he would offer them Dhan (donation) only if they help eliminating the dangers before the kingdom and himself personally. The Rishis grew furious and told the king that they would be committing a sin if they received alms from him and went away. Yet, the king sent gold and fruits through his ministers to them which they refused to accept. The angry king organized a yajna and sent an evil angel to kill the Rishis. They prayed to Perumal for protection. Lord sent Indira in the form of tiger (Puli in Tamil) and killed the evil spirit. This place is named Tirupuliyur after this event. Rishis said that Perumal alone is real and everything else in the world is but illusion – Maya. Lord thus came to be known as Mayapiran. Festivals: A grand Utsavam in Monthly Thiruvona Natshatram and in Aavani month Janmaashtami are celebrated in a grand manner. Another grand festival during the Month of Thai (from Jan 15) is celebrated during which the temple Elephant is dressed beautifully and the Utsavar is seated on the Elephant and rounds around the Inner and outer Pragharam. The temple is open from 05:00 a.m. to 11:00 a.m. and from 05:00 p.m. to 08:00 p.m.
Chengannur is on the Ernakulam-Kottayam- Kayankulam rail route and is about 40kms South of Kottayam. This sthalam is situated 3 1/2 miles away from Sengannoor in west. We can reach this Kshetram by getting down in Sengannoor railway station which is on the railway lane between Trivandrum (Thiruvanandhapuram) to Kollam via Ernakulam.